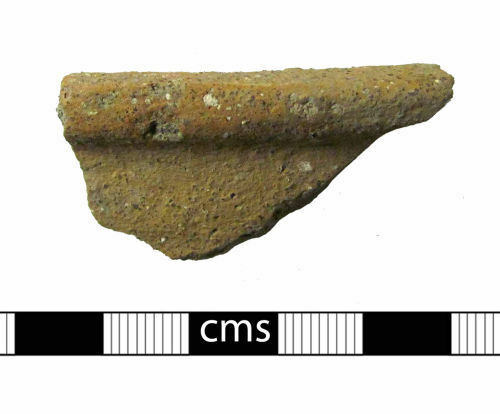 A rim sherd of a medieval domestic vessel, possibly a jar. The vessel has a rim that flares outwards from what appears to be a narrowed neck. The fabric has a grey core with small yet abundant inclusions of grit or sand grains and possibly chalk. The rim appears evenly fired with both internal and external walls a light orange in colour. The diameter of the rim would have been around 220mm.